There are an abundance of supplements on the market that claim to boost, enhance, or support the immune system and its ability to protect the body. Although many products make these claims, there is an obligation, as consumers and healthcare practitioners, to dig a little deeper and determine what is in the product and how it affects the body. Differences between the types of products on the market should be identified and regulations set in place for claims regarding the products. The Food and Drug Administration (FDA) regulates label claims on products to prevent manufacturing companies from using false or misleading statements.5 Although these standards are put in place, there are still products that over-promise, or make unsubstantiated claims regarding the benefits that one may experience by using the product. Using established, well-known supplement brands is one way to avoid these. 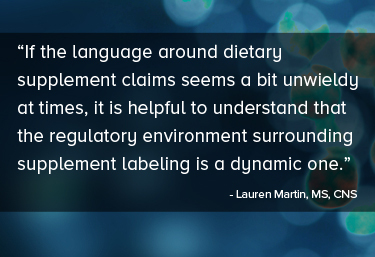 If the language around dietary supplement claims seems a bit unwieldy at times, it is helpful to understand that the regulatory environment surrounding supplement labeling is a dynamic one. It is first dictated by law, but also challenges to the law, precedence, and evolves as companies attempt to add new label claims regularly. Additionally, other governmental agencies, legal action against particular, competitive, or noncompetitive companies can influence how a company describes the benefits of their products. Dietary supplements, according to the Dietary Supplement Act of 1994 (DSHEA), cannot be marketed as a product to treat, prevent, cure, or diagnose disease – those claims are limited only to drugs. Often times, dietary supplements which include vitamins, minerals, herbs and botanical extracts, and other components like amino acids and fatty acids, are sold alongside homeopathic drugs and over-the-counter (OTC) medications. Homeopathic drugs follow a slightly different and, in many ways, more descriptive set of guidelines. The label may denote an indication for a specific symptom or condition whereas a dietary supplement would not. Label claims are not designed to distinguish efficacy (or how well a product works). OTC medications are able to use even more descriptive language often indicating disease states or symptoms. When a consumer is seeking the best support of their immune system, product labels from different categories may be the greatest red herring in the decision process. Practitioners need to be especially aware of labeling restrictions as it pertains to helping an individual choose a product. These tips can also be found in a customizable immune system supplement patient download. As with many products on the market, drug and nutrient interactions can affect immune support supplement recommendations. Use a drug-nutrient interaction database to find drug and/or a nutrient and/or an herb and drug interactions including both documented and theoretical interactions. This database can be used for a variety of supplement recommendations, including for the immune system. Lauren Martin is a Certified Nutrition Specialist practitioner who earned a Master of Science in Human Nutrition from Columbia University. She co-founded Martin Family Style, a lifestyle, food, and nutrition blog. Lauren is the lead author of the blog's nutrition section. She earned her Bachelor of Science in Nutrition from Oklahoma State University. Pan M-H, Chiou Y-S, Tsai M-L, Ho C-T. Anti-inflammatory activity of traditional Chinese medicinal herbs. Journal of Traditional and Complementary Medicine. 2011;1(1):8-24. Block KI, Mead MN. Immune System Effects of Echinacea, Ginseng, and Astragalus: A Review. Integrative Cancer Therapies. 2003;2(3):247-267. Aldahlawi AM. Modulation of dendritic cell immune functions by plant components. Journal of Microscopy and Ultrastructure. 2016;4(2):55-62. Dietary Supplements: What You Need to Know. Food and Drug Association Web site. http://www.fda.gov/Food/DietarySupplements/UsingDietarySupplements/ucm109760.htm Published November, 2015, Updated January 6, 2016. Accessed October 31, 2016.